BTW..can any one tell me y we Indians are always ahead in games which are played with a stick or some thing similar to that??? ഓര്*ഡോസ്*: പ്രഥമ ഏഷ്യന്* ചാമ്പ്യന്*സ്* ട്രോഫി ഹോക്കി കിരീടം ഇന്ത്യ നേടി. ഫൈനലില്* പാക്കിസ്ഥാനെ പെനല്*റ്റി ഷൂട്ടൗട്ടില്* കീഴടക്കിയാണ്* (4-2) ഇന്ത്യ ജേതാക്കളായത്*. പ്രമുഖരായ അഞ്ചു താരങ്ങള്* ഇല്ലാതെ പുതുമുഖങ്ങളാണ്* ഇന്ത്യയ്*ക്കു വേണ്ടി ടൂര്*ണമെന്റില്* അണിനിരന്നത്*. മൈക്കിള്* നോബ്*സ്* പരിശീലിപ്പിച്ച ടീമിന്* ഏറെയൊന്നും മുന്നേറാനാവില്ലെന്നായിരുന്ന്* വിലയിരുത്തലുകളുണ്ടായെങ്കിലും തോല്*വിയറിയാതെയാണ്* ഇന്ത്യ കിരീടം നേടിയത്*. LONDON: India's defence held its ground against desperate Great Britain as they clinched a 2-1 victory in the 36th Champions Trophy on Saturday, putting them at the top of the league standings with four points. Goalkeeper PR Sreejesh stood his ground against a number of shots at the goal, four of them on penalty corners, as India made use of a breakaway opportunity created by right winger SV Sunil and their defenders covered the angles well to emerge victorious. Playing deep inside their own territory in the first quarter against early British raids, India scored through Mandeep Singh on their first raid by Sunil in the 17th minute. Harmanpreet Singh then converted a penalty stroke in the 33rd minute, while Britain pulled one back through a penalty corner conversion by Ashley Jackson in the 35th minute. Allowing Olympic champions Germany to come back to draw 3-3 on Friday, India now have four points from two matches. Britain have just one point from a draw in their opening match. Earlier, Olympic champions Germany rallied from a two-goal deficit to secure a 4-4 draw with Belgium in the earlier game, which was disrupted by heavy showers that left the field water-logged. Play was stopped for half an hour midway through the Germany-Belgium match, until the water on the turf was swept away. Forcing two penalty corners in the initial three minutes, Great Britain were denied by goalkeeper Sreejesh as the Indian custodian blocked shots from Sam Ward and Jackson. Indians continued to stay in their own half crowd as Britain strikers repeatedly broke into the scoring zone, but were not able to take a good crack at the goal. Ward did not succeed in his diving attempt to reach a Jackson cross from left in the 12th minute and David Condon's shot from top of the circle in the 15th minute went wide to the right. India took the lead in the 17th minute on their first good move when right winger Sunil's fine run on the flank saw him break into the circle. Sunil's cross into the goalmouth scraped past a defender's stick and went to Mandeep in the goalmouth. Mandeep capitalized on the chance by pushing it into the goal. A few minutes later, Mandeep could have again featured in a goal-bearing move when he picked up a through ball deep in the British half. He was in a one-on-one situation with the only defender in front and could have burst forward, but instead misdirected a back-pass. British striker Nick Catlin caused some anxious moments in the Indian camp, but sent his reverse shot into the side of the goal in the 24th minute. Sunil again broke into the circle from the right flank in the 29th minute. Finding no support in the scoring zone, he failed in an attempt to beat the goalkeeper from a narrow angle. India earned their first penalty corner when Mandeep put the ball on to a defender's foot. VR Raghunath's low drag-flick was blocked by goalkeeper George Pinner, but Danish Mujtaba continued the attack on the rebound and it resulted in the second penalty corner. This time Raghunath's rising drag-flick struck captain Barry Middleton on the shoulder and the umpire blew for another penalty corner, which was upgraded to a penalty stroke on review sought by India. Harmanpreet duly converted the penalty stroke with a stinging flick into the top left corner of the goal despite custodian Pinner making a good judgement to dive in the correct direction. Trailing 0-2, Britain pulled a goal back within two minutes when a defensive error conceded a soft penalty corner. Jackson's rasping drag-flick converted the third penalty corner into a goal by placing the ball just under the cross-bar. The Indian goal came under threat once again in the 46th minute, but Sreejesh managed to deflect Simon Ward's shot just wide of the right post. 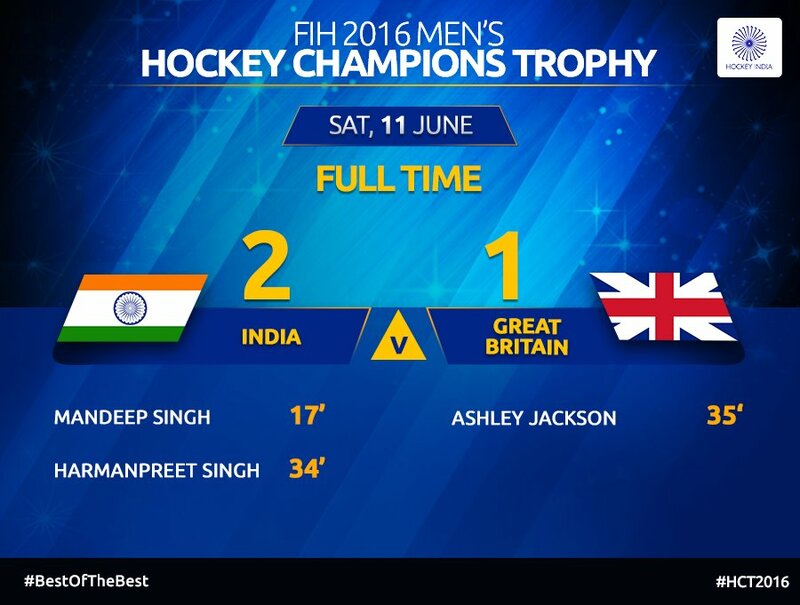 Mandeep could have scored another goal in the last minute when Britain had taken off their goalkeeper. Mandeep got a long ball from Harmanpreet, but carried the ball as he stepped into the circle with an open goal in front.